On a 2016 trip to Malawi a WFM committee member spent some time in a local school, in a village called Nkope, in the Monkey Bay area. Schools in Malawi are usually under resourced in every way. One teacher typically has a class of over a hundred students, often there are no desks or chairs and learning resources are few and far between. The blue cupboard, pictured below, represents all the ‘text books’ for a primary school of nearly 1,000 students. 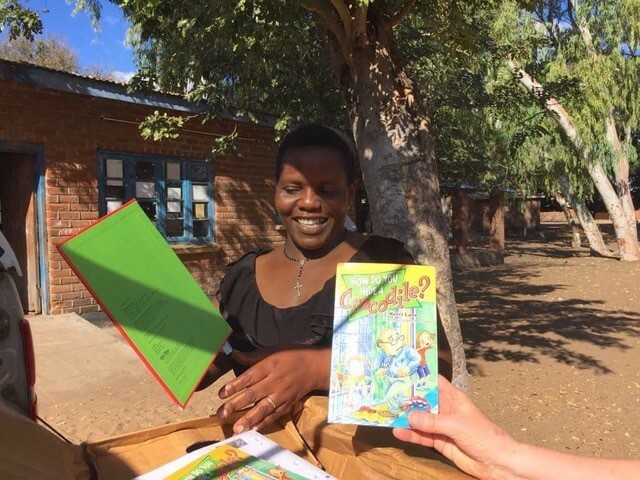 Being a teacher herself, our WFM member set about gathering boxes of unused resources from her place of work and, with the generous aid of Rehoboth Christian College, was able to amass 3 cubic metres of text books, story books and writing materials which WFM sent to Nkope School in 2017. Also pictured are teachers from Nkope, happily unpacking the books which will form the basis of their first library. Whilst Water for Malawi prioritises the provision of clean, safe drinking water across the country, we are also aware of the complex problems that Malawians face in other areas such as education and health and will help where we can.